The game I won’t shut up about, Star Wars: Galaxy of Heroes, just received a new character that all Resistance squads will want to have. Rey (Jedi Training), is now in the game, synergizing ridiculously well with BB-8, Resistance characters, and many other squads in general. 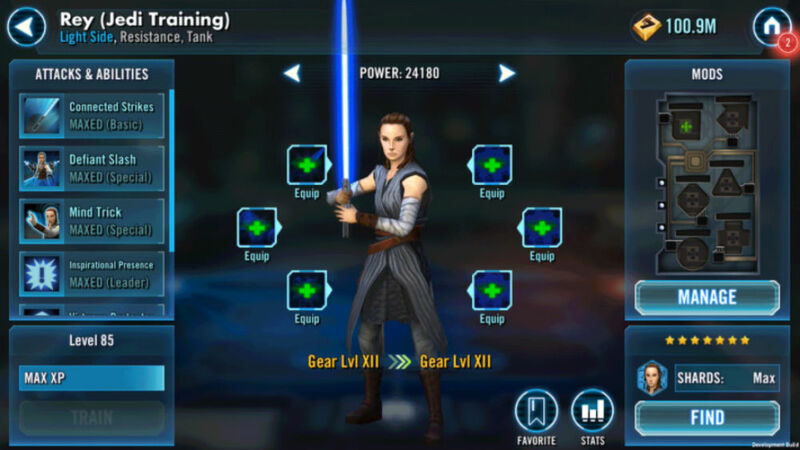 Rey (Jedi Training) can be unlocked through a limited time Hero’s Journey event, meaning unlocking her is no easy task. Much like Commander Luke Skywalker’s Hero’s Journey, you’ll need a specific 7-starred team to unlock her. You will need a 7-star BB-8 (which requires a 7-star First Order squad), Finn, Veteran Smuggler Han Solo, Veteran Smuggler Chewbacca, and Rey (Scavenger). As for her abilities, she is labeled as a tank, capable of applying debuffs, afflicting big damage, gaining Foresight, and much more. From the gameplay I’ve seen and discussions I’ve had with my own guild, the only downside to her tank label is that she does not taunt. Additionally, her kit is somewhat underpowered, unless she is strategically placed in a Resistance squad that is consistently applying Expose and receiving Secret Intel from BB-8. If you have the necessary characters, go try your hand at unlocking her! If you ever need help on your cantina table quest, feel free to hit me up and I can offer suggestions and insight the best I can.